As we have Seen How to Create/Make Block in DraftSight in our earlier Post. Now its time to See how we can Insert Blocks in DraftSight. Where is Insert Block in DraftSight ? Go to Menu: Insert > Block. How to Use this Insert block? Insert block setting will be based on Settings you used while Creating a Block. Tip1 : However you can modify these settings if you want . For this Run MAKEBLOCK command and From Name Drop down list select your block , Change settings and Click on OK Tab. select Yes to accept changes . Now, When you run InsertBlock command then ‘Insert Block’ dialog box will pop up. On this dialog box Path section is empty as this Block was created in same Drawing , but if you Browse block from Other Drawings then Path to that Drawing file will be shown here. You can Specify position of block with respect to X, Y and Z Co-ordinates or Can choose Check Box option as ‘Specify later’ to Specify position after Click ok on dialog box. Same as Position section you can Specify Scale of this block with respect to X, Y and Z Co-ordinates or Can choose Check Box option as ‘Specify later. Apply uniform scale: you can apply uniform Scale to block with this checkbox , in this case Y and Z Co-ordinates field will be Grayed out and You can apply uniform scale from X co-ordinate. 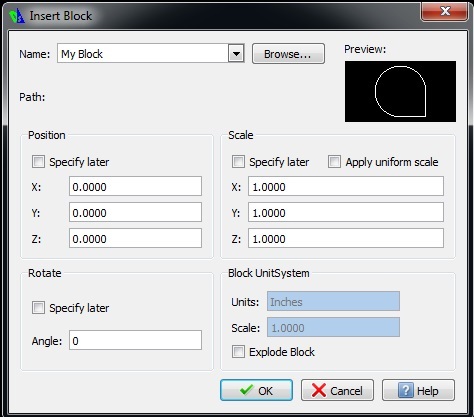 Note: If while creating a block you have Selected Check box for ‘Apply uniform scale’ in settings section then Inserting same block will Grayed out this checkbox option. To make it active Modify block as per Tip 1 above and Try to insert. Here you can enter Rotation angle for block or Select Check box for Specify Later. Units and Scale fields of this section is Grayed out , to modify this follow Tip 1 above. You can select this checkbox and After inserting block it will explode. This option on Insert Block dialog box will be active only if you have Selected check box for ‘Allow block to explode’ in Settings section while creating a block. If you uncheck this in Make block then on insert block dialog box it will be grayed out. Note: Insert Block accepts Active Layer style in Drawing. I keep doing this and then it dissapears from the sheet. Any suggestions? Note: This comment section is not active now. Please submit your question on our Community page! Is there a way to see the image as you insert it so that you can set the rotation correctly? Which version of DraftSight you are using on which OS? Are you saying that you are not able to see inserted images inside DraftSight?? 2. Run SMARTSELECT command: ‘Apply To’ choose Entire Drawing & In Entity Dropdown list instead of Multiple select ‘Image’ then click ok on dialog box. Now Run Zoom command and from Opetions choose ‘SElected’ by enetring ‘SE’ in command line and press enter. This will show your Image. If you cannot see image or only border line of image is showing then need to check your Graphics card or DraftSight version. Hope this will solve your problem!